Helmandollar had just bought a C5 Corvette and was driving it home from Bellmead, Texas. 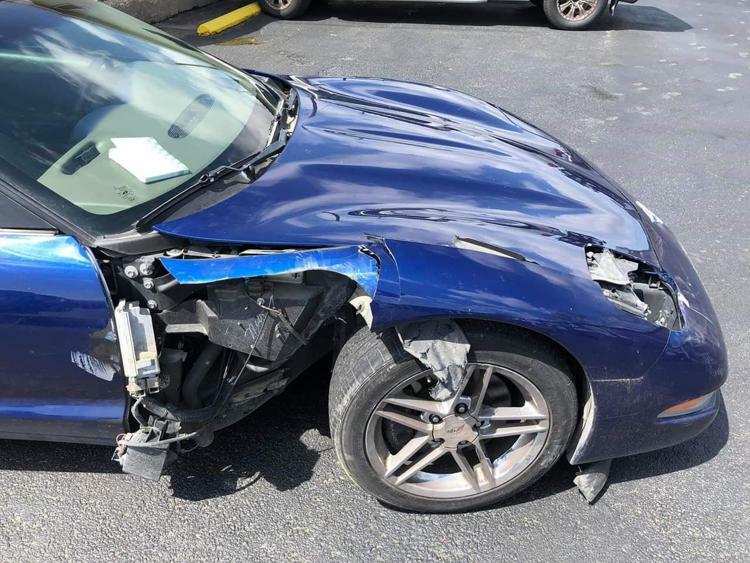 Forty five minutes into the drive, he had just pulled into Temple, when an 18-wheeler made a sharp left-hand turn from the wrong lane, and drove over the front-end of his Corvette. To make matters worse, the truck driver just kept going, but luckily, a good Samaritan in a Jeep saw the whole incident, and stopped next to Helmandollar to ask him if he wanted him to go after the truck driver. Luckily, the Jeep driver was able to catch up to the truck driver and get him to turn around and return to the scene of the accident. By the time Helmandollar’s wife Cynthia had arrived at the scene, her husband was sitting on the side of the guardrail hyperventilating, but luckily, without major injury. The Helmandollars were not able to thank the young man driving the Jeep. Right now, the Corvette is back at the Helmandollar’s house and they are hoping to hear from the truck driver’s insurance company. The truck driver was issued a moving violation by the Temple police for the improper turn. Hopefully, everything will work out and the Helmandollars will be able to get back into a Corvette again.